And there are certain power words that hold more sway over our decision making process than others. You might be surprised to find that these “power words” don’t seem … well, all that powerful. This speaks to just how damned efficient they are. Simple language is crystal-clear language, and these words make it clear just what you want your reader to do. And you might be surprised just how effective these deceptively simple words can be. I’ve listed these words below (along with studies related to their power) that will show you how to speak more persuasively to your audience. Warning: I can’t stress enough — just as in the application of writing headlines that work — you must understand why these words are persuasive, and you must use them in the contexts that make sense for your audience and your business. If you just start slapping them on every piece of content you create for no apparent reason, you’ll quickly see just how unpersuasive they can be. There’s an often-cited study in the copywriting world about a piece of Yale research that reveals “You” to be the #1 power word out of a supposed 12. Despite the fact that the study likely never happened, I have some actual research that reveals the power of invoking the self. According to recent research examining brain activation, few things light us up quite like seeing our own names in print or on the screen. Our names are intrinsically tied to our self-perception and make up a massive part of our identity. No surprise then, that we become more engaged and even more trusting of a message in which our name appears. Writing general web copy with name utilization in mind isn’t usually possible, but by capitalizing on the power of permission marketing, you can adapt this strategy easily — many email lists are greatly aided by being able to start off messages with a customer’s name. While that may not be important for your blog updates, if you maintain a variety of separate lists for your products (and you should), make sure you’re grabbing a first name to make your broadcasts trigger that personal aspect with customers. 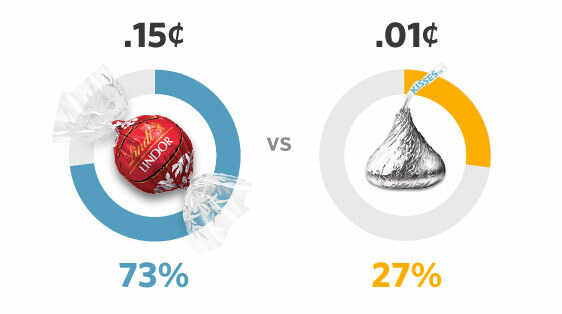 Dan Ariely revealed this startling fact in his book Predictably Irrational, where he examined a very unusual “battle” between Lindt chocolate truffles and Hershey Kisses. 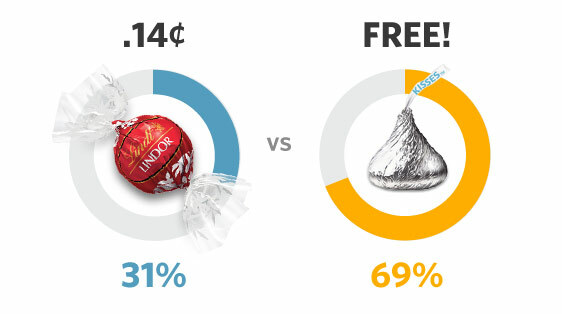 To test the power of the word “free” in relation to concrete value, the study first asked people to choose between a 1 cent Hershey Kiss or a 15 cent Lindt truffle (about half its actual value, generally considered a richer, superior chocolate). In other words, tastes were found to be very much in favor for the truffle. I mean, who’s going to pass up a deal, right? Later though, another random group of subjects seemingly flipped on their opinion of these two treats. Ariely revealed that when the price was reduced by one cent for both brands (meaning the Kiss was now free), people altered their choices drastically. Although in the first test it appears we simply can’t pass up a deal, as it turns out, we really can’t pass up a steal. Although the relation in prices remained the same (a 14 cent difference between the two), people chose the Kiss far more often when it was free. Ariely points to loss aversion (our disdain for losing out on things) and our natural instinct to go after “low hanging fruit” as the reasons why we are so susceptible to snatching up free stuff. The danger of free: As we’ve seen here, there is a certain inherent danger in trumpeting free things. Having something for free will attract more people. But that will most certainly include a fair share of “bargain hunters” who aren’t likely to turn into the superstar customers that really grow your business. Emphasizing the “freeness” of your free guides, courses, information, support, etc., can go a long way in attracting attention. On Sparring Mind, I emphasize the fact that my newsletter is “free to join,” because although most marketers understand this, many folks don’t quite understand what it means to subscribe. Conversely, you should use minimal pricing to keep out those barnacle customers who aren’t ideal long-term buyers, or who aren’t truly suited for your flagship offerings. In a study from the classic book Influence by Robert Cialdini, tests were conducted on requests from a person in a hurry to use an in-office copy machine. The tests examined how different requests might affect people’s willingness to allow this person to “cut” in line. In this scenario, around 60% of people allowed him to cut in line and use the machine first. Did you see the ever-so-subtle difference between the two? Let’s break this down: Not only was the request only minimally changed, but the “because” (his reason) was barely a reason at all! “Because I’m in a rush” wouldn’t stand up as a good excuse for most of us, right? Isn’t a majority of the working world in a rush? That went from having a barely passable reason to absolutely no reason at all for letting the man cut. In spite of this, 93% of people let him cut on this third trial, only a 1% drop from when he had a weak reason (“I’m in a rush”) and a 33% improvement vs. the first test. Although “because” may appear to have some sort of brainwashing effect on people at Xerox machines, it’s only really a matter of reasoning: even giving weak reasons have been shown to be more persuasive than giving no reason at all. Only trumpet features and product traits you are proud of when they help make your point. Use them to create an incentive for customers to take action. And use “because” when pointing out these compelling reasons, but don’t rely on it as a crutch. Several MRI studies have shown just how fired up our mid-brain gets when we envision instant rewards, and how it’s our frontal cortex that’s activated when it comes to waiting for something (that’s a no-no for sales). If you are in the business of selling web-based software, you already have an advantage here: “instant access” isn’t a vague promise, it’s often the reality. For those in the physical products or services business, reminding customers that they will receive their product quickly (or someone will get in touch with them ASAP) can go a long way in being the gentle push they need to buy. This is an area where many business get too optimistic, and although it’s smart to emphasis these instant rewards, it’s also always a good idea to under-promise and over-deliver, so be sure you can actually follow through on your promises or you may end up with a “tribe” that hates your guts. This one almost seems paradoxical. On the other hand, it’s long been known that novelty plays an incredibly important role in activating our brain’s reward center and in keeping us content with our products. How can you achieve a zen-like balance against these two contradictory sides of the same word? The important things to consider here are which parts of your business generate trust, and which parts generate utility. It’s your brand that creates trust, and as the saying goes, if it ain’t broke, don’t fix it. Your products however are what customers get utility out of, and stagnant offerings are your first class ticket to an abysmally bored userbase. Your core brand elements like your unique selling proposition, your dazzling customer service and your quality offering in the marketplace should be approached with excessive caution if things are going well. With your products, it’s far easier to excite customers with new features and polish. Even if things don’t work out perfectly, a majority of customers will appreciate innovation attempts over no progression at all (unless you pull a Digg v4 and ruin everything in one fell swoop). New fixes to old problems, new features and improvements, a fresh new design, or even new ways of getting your message out there (Red Bull anyone?) are all essential for keeping your customers “on their toes,” without losing the trust that has cemented you as an awesome brand in their mind. Let me know in the comments what you thought of the research above. 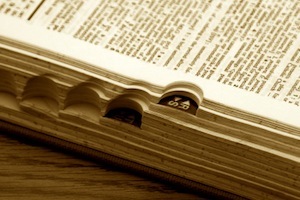 Also let me know about what words you love to implement into your persuasive copy. You don’t need to cite research, just give me a reason why. I often listen when the the word “Appreciate” is used. It’s a word often used by Mr. Nelson Mandela. Meet you out the back. Interesting… why do you think that is? I would imagine that “appreciate” has some really meaningful connections to our ego. Not too sure if your prescriptions (which do make sense to me) are universally applicable, especially as regards the words ‘free’ and ‘new’. For some audiences in the UK and Ireland these two words can have negative connotations. ‘Free’, for example can be associated with ‘shoddy’ or ‘valueless’ or ‘they wouldn’t be giving it away for free if it was any good’; while ‘new’ can give the impression that the product is ‘untested’. I wouldn’t have agreed with you but last year a friend put an ad for free poodle puppies in the paper and didn’t get one response. She then put in an ad to sell them for $100 each and they were gone in a week. Lisa – free, for some, means too good to be true. By having a value people can understand response is bound to be higher. You presented some interesting research here because it is fascinating to learn how we are converted. I don’t write persuasive copy, but I will start using some these words more often in my blogging. Perhaps I can use this type of language to help persuade more people to comment. I’m in the same boat as you, lacking persuasive copy. I also enjoyed seeing the psychology behind how we make decisions and are converted to the message. I would also add that you ARE writing persuasive copy, even if you don’t write sales pages, because any business related writing will at *least* have the simple goals of getting people to read all the way through and then take some sort of action when they’re finished. You are right. Business writing is persuasive writing, It revolves around persuading your boss, or persuading a colleague, and not selling a product per se. Selling your boss on an idea is converting a lead I guess. Perhaps I feel am not writing persuasive copy, but in reality I am. A surprising piece that is nicely done, and I notice that you model the strategies nicely in your own writing, with “you need,” for example. “You” in the number one position was especially surprising since it counters everything we’ve been taught in other types of writing. Teachers always scold when if you adopt the second person, but what you say makes perfect sense in engaging the reader. As a university English professor, unfortunately, I still have to teach this because all of the other professors while criticize the use of “you.” I guess it all depends on your purpose in writing, the audience’s needs and expectations. The others were less surprising except “because,” which struck me as unusual at first. However, you make clear how the word establishes the significance of the message for the reader. These are all things that we are not normally conscious of, and therefore very helpful to consider. Thank you. I don’t remember where or explicitly what, but I recently read an article that commented on writing as taught in school as being suitable only for the academic community. The gist was that this ‘formal’ writing didn’t actually communicate with the world outside academia and that an ‘informal’ style that used contractions and other speech-like forms did a better job with sales, instructional material, etc. I do not doubt it, and the battle is often fought between the sciences and humanities in higher education. The sciences tend to be prescriptive with language and writing, wanting to freeze academic language in time while the humanities lean towards the descriptive (a little bit), believing that languages change over time. The main objective is to communicate your purpose and message to an audience effectively. The real difficulty lies in determining where the boundaries are drawn. With too much freedom, communication is hindered, but with excessive restriction comes the scene as you describe it. I like the approach taken in Gregory’s article where he focuses strictly on his purpose, message, and reader. Great points Darin, really appreciate your thoughts. I would clarify on “You” just a bit: it obviously isn’t appropriate for certain styles of writing, but in this instance I actually use “You” in reference to the self, that is, your *name* is actually one of the most important words in your own mind. Hey, thank you for the follow up and clarification, Gregory. It’s great when bloggers participate in the conversation! Looking forward to reading more of your writing. Hey, thanks a lot Brian! I can’t wait to read it:) And of course, I’ll give feedback. Cheers! Great stuff! I’d like to nominate a sixth word: SAVE. When people are buying something, they’re often more interested in getting a good deal than paying a low price, and SAVE implies that they are indeed getting a deal. People also like to save things other than money, like time and effort. Do you have any research supporting the power of SAVE? Really like this one John. I like it so much that I think I’ll have to look around for some research on the subject! Good stuff Gregory. Interesting point on the danger of free attracting the wrong kind of customer. I’m sure the 80/20 rule applies here. I also like the words “check”, “how”, “why”, “try” and “value”. They can certainly be persuasive. I agree with John Pohl that “save” is a good word. I also like “now”, “hurry”, & “limited”. I enjoyed this article and look forward to more. Just expanding on the word ‘you’ a bit further, it is particularly effective when used with certain simple (but also powerful) verbs, e.g. – EXTREMELY limited access. I wanted to convert a 166-page PDF and went to a “free” site. After giving all of my contact info and doing the confirmation email, I converted the file and … oops … “free” means 3 pages. My other 163 pages would have cost me about $10. I was irritated by then that I left the site and blocked the domain fomr ever coming up in future Google searches. I don’t chase free things because I’m cheap. Often I have legit interest in something and the marketing just irritates me because they’re being slimy. Marketers need to be judicious about what they call “free” because consumers are learning to put bogus or even offensive data into online forms just to peek over the wall and see if the marketer is really delivering what they are touting. Now, what good is the data that’s been collected? Absolutely agree — it all has to be in context. If you’re in a context of providing solid value with content + you’re getting good word of mouth over social platforms, “Free” is something your audience will feel they can trust. But all of these classic persuasive power words are used extensively by businesses that are dodgy or spammy, as well. I think this is more important than the 5 Most Persuasive Words. So many marketers are abusing these words. Yes, there are studies showing that the words work. But will they work in the long run? If you look up ‘banner blindness’ is shows a habit that people have for consciously and subconsciously being blind to ads. We’ve been trained. Ads not only try to sell to us, they also have a history of being associated with malware, pop-up storms, endless redirects, etc. SImilarly, we can be trained to be suspicious of words like free and instantly. We might be “persuaded” but then we can be “trained” to click on something and stay there long enough to determine there’s something useful or just bait to build their list and load users into an auto-responder. Marketers are going to have to do more to cultivate trust. This will ensure that the persuasive words remain persuasive or, they can turn into warning flags. Also, it wasn’t brought up that maybe the reason the $.15 sold over the $.01 is perceived value. Perhaps the word “Free” would create less suspicion if it came with a “Because”. A well formed story, and your final 2 points highlight my own – that you made this an interesting exercise to practice putting these words together into a sentence or two, which is exactly what I did as I posted this to facebook… I used all 5 words in two sentences, that will become clear to my friends after they read it. As I started your article, the first book I thought of was “How to win friends and Influence people”, our names are our most important power word, and your tie in with mailing lists was spot on with that. Thanks for sharing such a succinct and insightful article. It always intrigues me that ‘need’ is NOT a trigger word. While it is always emphasized that buying is an emotional process based on desire and not logic, it seems to me that need would be at least equally motivational emotionally. I’d like to nominate ‘GET’. Because everybody wants something. As always, a very helpful post, Brian. Happy Holidays! You & Your – such powerful words, but how many websites talk about them? The analysis around the word free was really interesting. I’d like to think that I’m smart enough to see through the marketing when it comes to free stuff, but either I’m really naive about how I really think, or I’m in the minority. I don’t tend to offer free stuff because I think that people tend to see through it. but maybe it’s just me! Might make me reconsider making free offers in future. Good points Dave, but I think we become susceptible to these words during situations where they aren’t directly on our minds. For instance, reading this post, these words seem “too obvious” to be effective, but out and about in the real world when we aren’t consciously thinking about them, they’re able to influence us. A surprisingly short post for you, Greg, but just as excellent as ever! We recently started using customer names in our email blasts. I don’t have any numbers yet, but we are definitely seeing more conversions. Getting intimate works, plain and simple. I’m not sure I agree with the use of a person’s name – in advertising copy, it seems manipulative to me when I see it. Especially if it’s in an email from someone who I know has no idea who the hell I am (and that goes double if they’ve spelled my name wrong). But then, I’m in marketing, so I’m probably a tougher audience. People in general are more cynical and aware of marketing “tricks” than they used to be, though. It’d be interesting to see how some of those stats have changed over time! Our target audience are mechanics, and used to be video store owners (still is, but less these days). We’ve had people respond to our emails as if we’d sent them directly, so I agree marketers are more skeptical. We also noticed (and we never figured out why), that the mechanics (or their assistants) tend to post correct info including the phone number, whereas the video store people gave us bogus info. Perhaps we’re saying something wrong on the download page. I’ll be checking into that after this article, Thanks. Hi Gregory, great post. I’m a huge fan of using “you” in copy. Why? Because it’s the equivalent of using someone’s first name in a mass communication. Yes, actually using their first name would provide a better result, but using “you” as a first name alternative gets nearly the same results. 15 cents should be $.15 or 15¢ (.15¢ means 15/100 or 3/20 of 1 cent). Ditto for the other amounts. Thanks! While using certain words is important I think its more important if you speak with conviction as people will pay more attention to what you say. Very true! In fact there is research on things like confidence + persuasion, and many studies point to conviction playing a HUGE role in persuasive speaking and arguments. Thanks! I found this article to be helpful with the work I need to do on a daily basis. Writing persuasively is so difficult because you don’t get the chance to listen before making your argument. Oh, how I fought the “you need” in a Tweet the other day. Days went by and that hashtag my name and what I needed to do rolled around in my head. Finally and against my will my curiosity got the best of me. I clicked the website. When the “you need” is hard wired to my core interest and there is not even the slightest whiff of spam anywhere to be found, I was a goner. You’ve got to hate that. Or, you’ve got to figure out how to use it. Your call. P.S. The person blew it though. You get to the site and it is miles away from the implication and someone just burned a bridge. The one that leads me to take ” you need” seriously. It is like a vaccination. Next time the bug has a harder time. Or, no shot at all. I agree with your list of words if our goal is to sell. I’ve taught advertsing and understand the basics of writing great headlines and copy. As a blogger, I’m creative and try to be sincere. I shudder to feel like I have to use advertising tactics to simply get more traffic, but I guess it comes with the territory. I think it’s very possible to be persuasive and sincere at the same time Dan. It’s sometimes tough when we feel like we may be going “too far”, but as long as everything is honest, it’s okay to utilize this information to get people to take action. All good ideas and reminders. I too am suspicious of “free” yet really like “because” as folks like an explanation. Thanks Greg. Great post. I saw four of the five coming but I have to admit I would never have picked ‘Because’. But it makes sense. Now to make sure that I keep these words in the back of my mind when writing. Cheers! Indivdually, each of these words appeals to a certain kind of person. If we use the Eisenberg Modes of Persuasion as a guide, we can assign each to a different mode. “You” – Humanists are relationship oriented. When your voice shifts from “We” and “our company” and you speak to them in the first person, it feels more human — and more Humanistic. “Free” – This word appeals to the Spontaneous reader. These visitors are just looking for an excuse to take action. “Because” – Methodicals want to understand the details. They make decisions deliberately and logically. Credible proof is important. “Instantly” – This also appeals to our Spontaneous reader, who wants immmediate gratification. “New” – This appeals to the Competitive, who wants to know what will make them better. New technologies, new versions, new looks get their attention. So, two of the words are very Spontaneous, and we tend to act spontaneously when we’ve decided to buy something. So, “Free” and “Instantly” are probably good “bottom of the funnel” words. I’m going to start using “because” more when I’m in a rush. I think I’ll still get scolded, especially in the grocery store line in Philly. It’s cool to read WHY those words we use in our copy actually work – and why sometimes they can be used incorrectly. Great article and great feedback. A number of months ago I felt that I was writing too much copy with “you” in it and decided to switch to “we” instead. Based on your article, I think I will go back to these articles and compare my reader engagement. It will be interesting to see if there is a difference. When you’re venturing into “because” land, try also using “so that” so that you can easily describe cause/effect relationships that enhance the persuasiveness of a message. These are really interesting. I love that because is on the list. I would like to politely disagree Gregory my man. Great post bro. Always enjoy your research. And you know what? You point to the fact that the context is really what’s important. The words happen inside a context. Do I want to see “free” at a plastic surgeon’s website? Oh, Lord! For more flavor, I’d add “BANZAI!”, heh. You can also use the word ESPECIALLY to justify a call to action. Unlike because,you can use ESPECIALLY to confirm your reader’s justification for wanting a particular product or service. Thank you for the practical advice and theory,especially the referenced academic studies. You nailed it! A very good blog on the subject of writing persuasive texts. I would like to add that these words, in combination ith the three modalities that people perceive the wworld surrounding them is even more powerful. Thank you! A fan of words, I enjoyed this post very much; very interesting and inspiring. Great article. Way to put 5 great topics into one short and to-the-point blog. One phrase I’m trying is “CLICK HERE” and seeing if that works. From what I have learned, some people like to be told what to do. You lead them through the process while giving the impression that all choices are made by YOU. I thought it was a great comment about how in English class we are taught not to use “You” or “I” but to write academically. I guess it really depends on your audience and the search criteria they are using. I know one word that really helps. When I was reading, I thought the word “Warning” was one of those words you were talking about, but it wasn’t even part of the article. And as far as “Free” goes, I’ve heard that “Free” can be a bad thing too because it lowers the perceived value. Yeah someone wants something free, but when the person has to spend money, are they going to buy the Hershey Kisses or the other kind? I would have liked to see the conversions of the people after the test, whether or not they became customers or bought anything afterwards. Another thing I would personally like to see is if someone is telling me to click on a link, I want to know exactly what I’m getting myself into. If not, I assume they are hiding something because they won’t tell me what the hell is going to happen once I click that link. As one person says, “Free” usually means “Free for 7 days, then it’s $39.99 a month” and they don’t mention how difficult it is to get through to customer service to cancel. Or all the other assortment of not-so-free sites. I agree with “Click Here” when it comes to the web, I’ve tested that on multiple occasions and an “action phrase” like that almost always outperforms other words. I’m going to experiment with this, and make an effort to notice when I used these words and what effect they have. Report back! Where will you be testing these words? Well-researched article. Using simple language is the way to write. Now I agree more with #5 because before I always replace it with the word “improved”. But then it’s the right timing that makes these words most persuasive. Great article. Eh, I would say they go hand-in-hand on many occasions. The persuasive element here is the *novelty* of whatever you’re describing, and “improved” often implies that something about the product is new. Found this really interesting. Most of them I can see how they work. For me the first one can be a complete turn off!! If my name is anywhere other than in the titles then I switch off. My Mum used to put my name in a sentence as a put down or to let me know I was in the wrong – it still has the same connotation!! True, but a lot of testing with personal communication (read: email marketing) has shown that names often increase open-rates and engagement in many instances. I remember a MailChimp article that showed exactly that, so it’s something to consider. awesome and informative stuff here.. Love to read it.. Normally, i will incorporate this word in my article: I, me, you etc.. and it is worked, my blog looks more alive..
It’s definitely a great way to promote action immediately, and on the web, you rarely get a second chance if you lose someone the first time. But be careful. Using these words to draw people in, and then not delivering anything, that can hurt a person’s reputation and train people on what to ignore. Yes. We get one chance to make an impression. Don’t miss an opportunity, but don’t ruin the experience either. Awesome information for a newbie like me to get his hands on. Thanks! Who amongst us can resist the alluring nature of the word “FREE”? Posts like this are why I love Copy Blogger. The info on here is great and has really helped me improve my writing over the years. No matter how long you’ve been writing, there’s always something new to learn. Lots of us can resist the word “free.” We’re being trained to be suspicious. See some of the earlier conversation. “Free”, “New” and “You” were quite obvious but didn’t expect “Because” and “Instantly” in the top 5 list. I expected “Now” word. These are specially great for writing ads, where you have so little time to grab someone’s attention, not to mention the million other ads competing for those same eyeballs. Great, useful article. Anyone looking to improve their copywriting skills should spend some time learning all the “power” words that can dramatically improve engagement and clickthrough rates. Very true, advertisements are a medium where you have a very limited time span to catch attention. I hardly ever write copy. Most often I just correct it. Coincidentally however, I just helped someone write copy for an advertorial of sorts today. I think it’s important to say “we will” as opposed to “we can.” “We can” just sounds too much like “we may,” while “we will” sounds more certain. Agree? The world will be pleased to know I’ve ordered that Cialdini book. Everywhere I go recently that book is recommended. Can’t wait! Great post – I loved the Chocolate study, that’s fascinating. Gregory – YOU did a great job with this article BECAUSE it INSTANTLY helped me idetify specific ways to make my copy more persuasive. I hope I can reciprocate in the near future with NEW ideas for you in my next blog post on Harvard Business Review. Thank you. I find thank you and reciprocity to be attractive words as well. I do agree that FREE is a great in attracting attention. But over the years, I do notice that FREE attracts the wrong prospects as well. Now I actually charge a nominal fee for all the workshops to capture a better qualified audience. I’m not sure about the “because” but You, free, instantly and New are difintely words that gets my heart racing. Like most people, I like to hear my name and see my name in big lites. Who doesn’t love free? Only thing about free is that it can sometimes devalue valuable things. We take things for granted when they’re free. Like mostly people today, we want everything and we want it now. Instantly ain’t fast enough sometimes. Definitely love new. Been buying used stuff so long only new will due for me now. Thanks for the information! I’m writing a sales letter for my ebook so you already know I turned to copyblogger for advice ?. I read a blog a year ago where the writer had done tests to his “follow me on Twitter” link to see what compelled the most people to follow him. He ended up with “You should follow me on Twitter”. I wonder how much the “You” had to do with that being the most compelling version. Now I also wonder how much more compelling it would have been if he had had a “because” in there. A word I keep thinking of is “beta”. Many people like the idea of being the first one to try something new. I know I do. Giving people access to something prior to the “general public” makes them feel special and will likely lead to brand loyalty and engagement. I always think when I see things like: “These are selling like hotcakes. Only 5 left. Hurry. Don’t miss out!”. This makes me think: “If they’re selling so fast and furious, why are they so bent on urging us to buy?”. They don’t need to! Not for headlines, but within copy, it is important for me to use the word LIKE somewhere in there for two reasons. The first is such usage almost always is in an analogy, and anologies work well in persuasive writing. Analogies are like pictures, they convey more than the words they are comprised of. The second is that within the analogy, I always try and put the word like in front of what I am persuading about. For example, if the new “what-a-car-mobile” is something I am trying to pursuade some to take interest in, I could say “Seeing a double rainbow is for visual pleasure much like the what-a-car-mobile is for driving pleasure. The embedded secondary statement that speaks to the subconscious is ‘like the what-a-car-mobile”. As a Public Speaking Coach and Trainer, I teach 4 of these to my students! I have started Copywriting more and more to learn more about persuasive speaking! Thank you for the tips! This is a fabulous blog post. ‘You’ is a very powerful word that stands out to me above all others. ‘You’ creates a personal relationship between a reader and the content that they are reading. Content writing often misses out in creating a relationship with the reader. I use superlatives to make products and services seem more attractive. Saying something is lovely or beautiful, amazing or remarkable, is powerful stuff. The word “because” is definitely an important word to implement when using persuasive language. Especially when you’re trying to get your kids to do stuff like clean up their room and things like that. Great post by the way! yup, those are 5 very persuasive words! I can’t help but feeling a little sleezball knowing these psychological tricks and using them to get conversions. From my experience, while “You” is indeed deserving its spot, an even better one is a person’s own name. We all hear our name from the very first days of our lives – we are conditioned to pay attention whenever that word is used. “Gregory!” … “you” would turn your head “instantly”, not “because” it is something “new” but simply “because” you are trained to do so from way back, during your childhood. Thank you for making me smile in a VERY hectic week. Of course, you are right. But I write historical fiction and while ultimately I’m selling a product, something in me rebels/resists using outright marketing strategies such as those outlined here. BUT I do want to reach my audience. So I’ve got my toe in and appreciate very much this NEW and FREE information you’ve made so INSTANTLY available BECAUSE you have helped me. Thank YOU! because you asked me to I’m going to instantly give you my new opinion, for free! When I started blogging about yoga I quickly realized that my average competitor was writing a lot of blah blah blah posting photos of themselves in insanely difficult yoga poses, talking about their “beautiful” kids and supportive spouse. yawn. Even I don’t want to read about that, and I’m a professional yoga teacher! So I started talking about “you” and things that might be of interest to “you”. Assuming that the average yoga practitioner is smart, green conscious, politically savvy I started instantly started blogging on new topics like big pharma, organic foods, and relationships because, you know, people like to read about interesting things – not just “me” and how my day went when I worked out. Simple and definitely meaningful tips. As Dale Carnegie said many years ago “the most important sound to a person is the sound of their own name”. A challenge though with digital communication, eg. communicating with parents via Facebook to help one another, the hardest job in the world with little to no prior preparation and loaded with exhaustion, frustration and loneliness. I took a few great tips from your article, any others would be greatly appreciated by this parent and others ? Thank you again all the way from Down Under. Persuasion is written and verbal and I think it’s true people like seeing their name in print, hearing it called. Persuading the brain in advertising is an awesome process when you see it unfold. I like to use the word “imagine”. I think it is a way to get people involved in the content being discussed. I suppose it is a way to try to force them to think. Once they are doing that, it may be possible to lead them in a certain direction by providing compelling arguments, research results, and information. What do you think to this approach? That’s called “invoking the mind’s eye.” Very powerful. I should have mentioned it in the previous post, what an excellent and informative article that was. Certainly some food for thought there. I will keep this in mind when writing content for my site. Love this article. I’ve bought so many marketing tools, plugins, themes, etc. and most, if not all of these persuasive words were in the copy that sold me. Great article really helpful for getting into your customers head and there thought processes. Very interesting and helpful. The word, “Please” is also very persuasive!